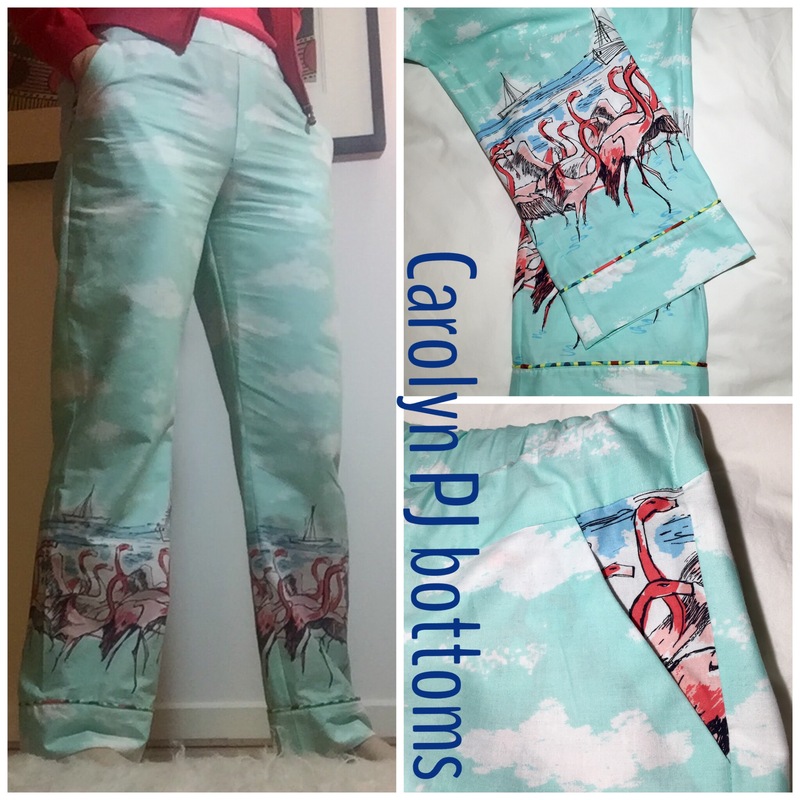 I’d looked at lots of fabulous pairs of the Closet Case Files Carolyn PJs on blogs- everyone loves them…and what’s not to like about pjs with piping?? I don’t really go in for matching pjs but I love a good pair of bottoms and these have a great shape and proper pockets. Closet Case is one of my very favourite pattern companies- the combination of style and fabulous pattern drafting is a winner for me… see my embroidered Kalle dress, navy pinstripe Kalle, silk Kalle one and two, Kalle shirt, Ebony tee and dress, houndstooth Clare Coat, Carolyn pj bottoms in a knit. I also have 2 pairs of Ginger jeans which I’ve never got round to blogging because so many others have done it so well. 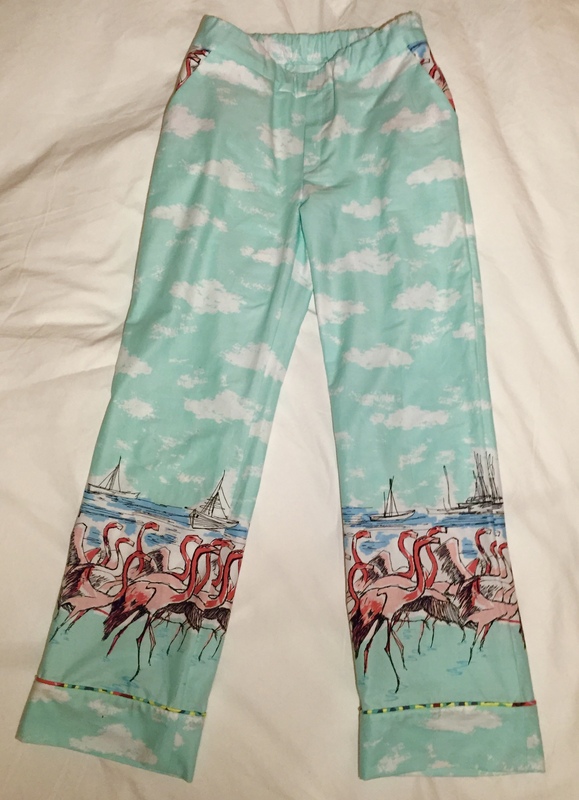 I bought a piece of the Michael Miller Flamingo Border fabric in seafoam from the Village Haberdashery on a bit of a whim and no idea what to do with it. 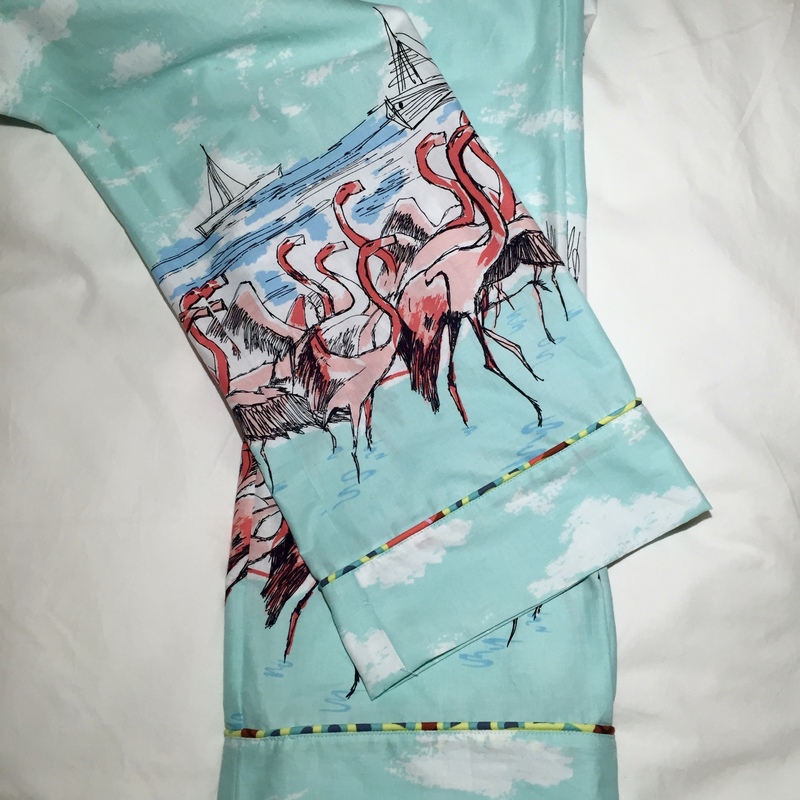 As it turns out it is perfect pj material and lovely cotton to wear. 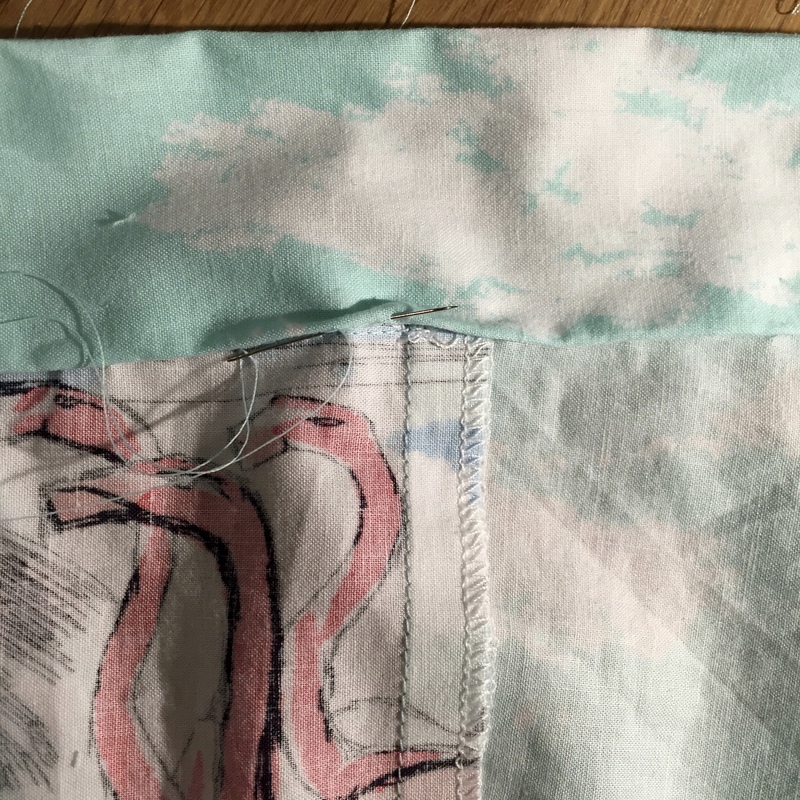 The border is printed horizontally across the fabric which means it has to be cut on the cross-grain. The main trouser pattern piece of View B (with the cuffs added separately) just squeeeezed onto the width of the fabric in my size. This is an easy pattern to put together. I really like the clever pattern construction on the pockets- all in one piece. I added about an inch and a half to the bottom of the pattern piece to make them a bit deeper. Although someone came in to talk to me as I was cutting the pieces out and I cut at the original line instead of the extended one- oops. Serves me right for being too lazy to adjust the pattern piece! 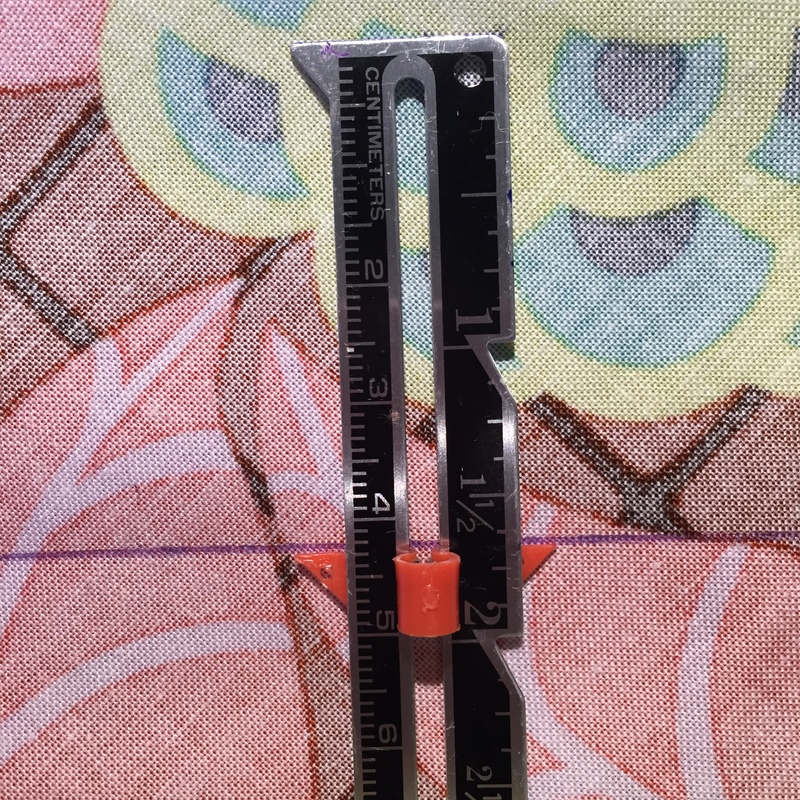 I ended up just fixing it using a 3-step zig zag stitch (w7.0, L 0.4 in case I forget) and carrying on since it was on the inside and couldn’t be seen- that’s the line in the pic below. I didn’t have any interfacing handy for the pocket edges either so used a wee strip of selvedge instead. 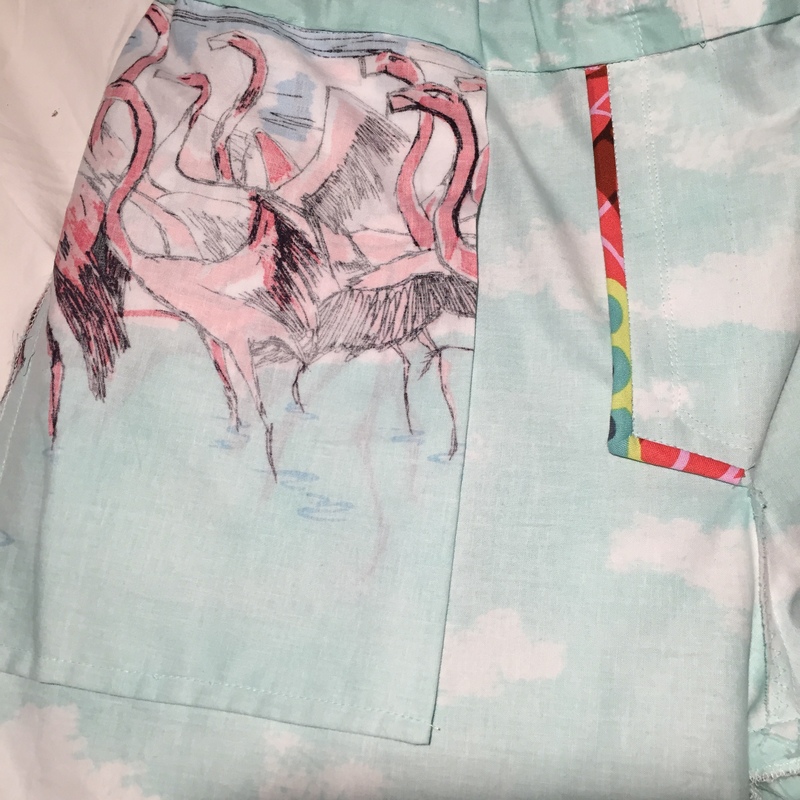 I played about with pattern placement for the pockets so I could get the peeping flamingos. 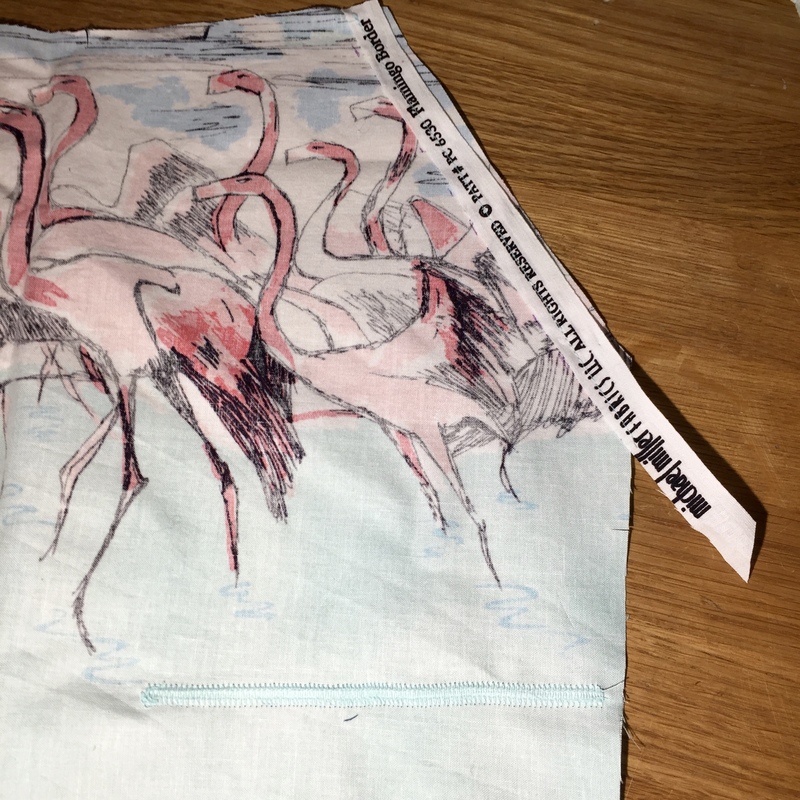 I had made piping for the pocket edges and ended up deciding not to use it because the colour of the flamingos was enough. The faux fly is a nice detail. Although mine opens on the left not the right, left-handers prerogative to change these things, also I liked the finish on the bias binding better on that side inside the bottoms. I left the top-stitching on the faux fly till last, rather then do it early on in construction as the pattern explains then extend it once the waistband is finished. I just basted the fly piece down so it was out of the way and then removed those basting stitches as well as the ones in the front seam right at the end once I’d added the top stitching. I hadn’t used corded piping on clothes before. Although I did use flat piping on my Merchant and Mills Dress Shirt which was a pain to keep even all the way along the length of the seam. The corded stuff was much easier to sew. The tutorial on the Closet Case Files site is great and makes the whole process crystal clear and really easy. I used an Amy Butler quilting cotton to make the piping . It would never be my first choice for dress making but the colours were so perfect it had to be done. It is a little on the heavy side for the Michael Miller fabric I think but works ok because it is so far down the leg. I cut my bias strips at just a shade over 1 and 5/8″ wide and they made perfect piping which matched the seam allowance exactly. I don’t have a piping foot (but think it will be on the list after this) and used the zipper foot which worked pretty well at all stages of the process. I don’t always realise how little attention I pay to pattern instructions until I can’t get something to work. 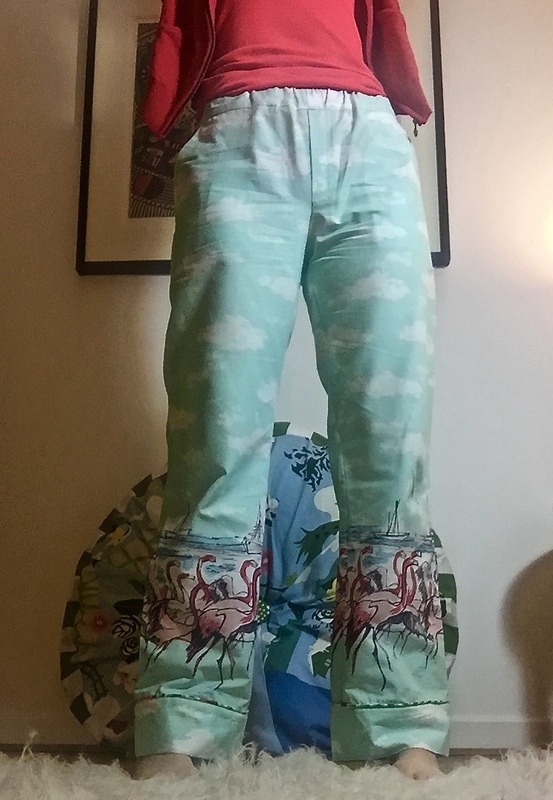 I couldn’t figure out why the waistband didn’t fit so took it apart and re-sewed it a bit smaller- then actually read the instructions…I’m used to matching side seams for a waistband and not back and front seams…so waistband taken apart again and re-stitched to original length. Of course it was a perfect fit second time round. I hand stitched the waistband on the inside rather than stitch in the ditch. I like the clean, invisible finish it gives. 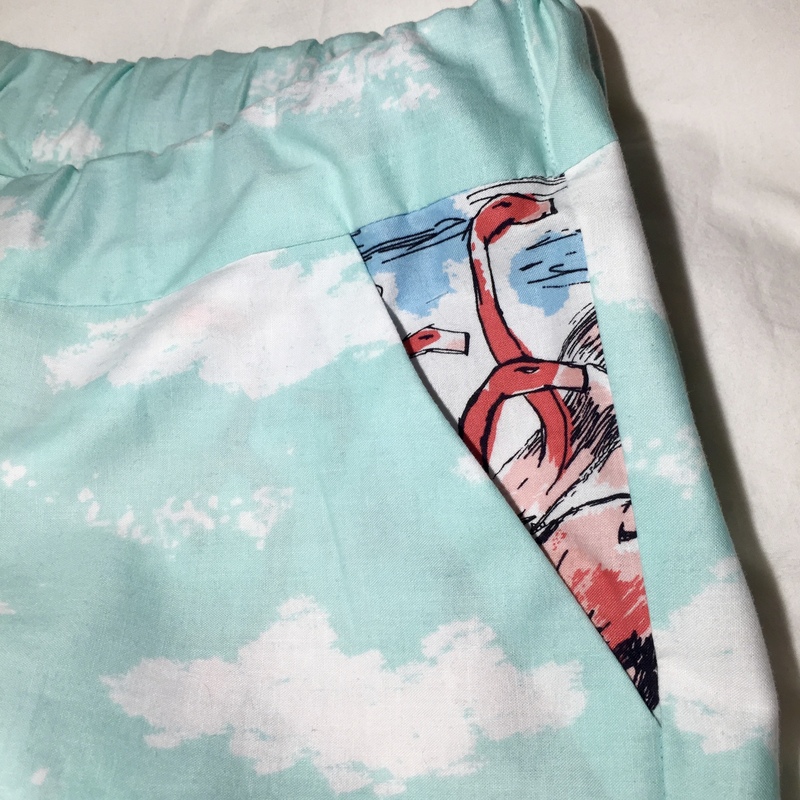 The final step was to stitch the side and back seams on the waistband to hold the elastic in place and add the top stitching (I left out the bar tack). I might still add buttons to the fly if I can find ones I like enough.